Kitchen! Kitchen! 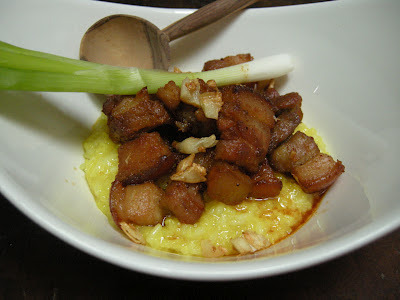 : dry adobo.....a tribute to my mother and my sister....at kitchen! kitchen! 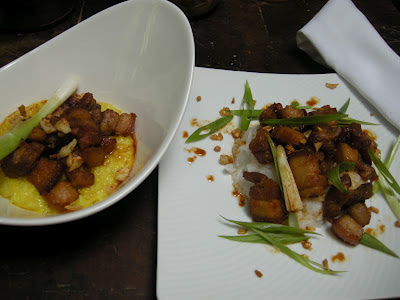 dry adobo.....a tribute to my mother and my sister....at kitchen! kitchen! toasted garlic. It is to die for! I don't know where the "dry adobo" originated from, but I remember when I was young that my mother and our eldest sister Patring makes this. I think this dish is also one way of extending it's flavour. This dish seems to get better each day. As a tribute to my mother and my sister Patring, who were both absolute and excellent cooks, I decided to make it. My sister had my mother's talent in the kitchen and my father's brains for business. My niece Pam, came to NJ for a visit along with her daughter and my sister Cora. She was the one who imparted her mother's recipe for "Patring's adobo", as we call it and my sister's own version of course. But, I've always wanted my mother's dry adobo. I could literally taste it in my mouth everytime I think of it. 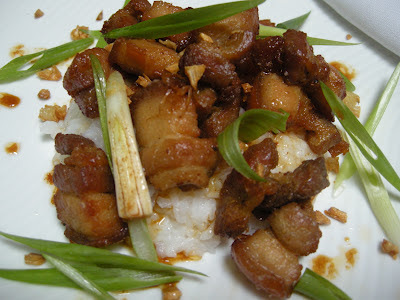 So with my sister's recipe of her classic adobo I was able to duplicate my mother's dry adobo. Talking about 2 in one. The technique of turning the classic adobo into the "dry adobo" defers from region to region or from cook to cook. My technique is a bit time consuming. However, you can achieve the same result by doing the classic Filipino adobo. And this could either be chicken, pork, beef or any meat for that matter. The classic recipe involves a lot of garlic, vinegar, soy, etc. So for a recipe, google "Filipino Classic Adobo" and let it simmer until the liquid evaporates and allow the meat to brown and carmelized. If the meat starts to break down while the liquid is evaporating, take the meat out until the liquid is completely gone and put the meat back into the pan to brown and carmelized. Add a little vegetable oil or olive oil to keep the meat from drying out.